Chakra Cuisine, Beverly Hills. HL gets an insight into the exquisite culinary world of celebrity chef Kai Chase. Her style of New American cuisine featuring a signature twist of Cuban and Creole and her love of food have made her a favorite with Michael Jackson, Steve Harvey, Jamie Foxx, Mary J Blige and President Barack Obama. This beautiful California native shares her tips on healthy eating and what made her the chef to the stars. Healthy Living Magazine: You mentioned the salad you will be making for us today is a favorite among many of your celebrity clients. Kai Chase: This is a favorite of a lot of my California clients. Steve Harvey loves this dish and it was one of Michael Jackson’s favorites. It’s a very simple Mediterranean style salad. It’s called the Seared Ahi Tuna Salad Nicoise. It’s a healthy, all organic blend of seared ahi tuna that’s coated with herbs de Provence, accompanied with tear-drop tomatoes, Haricot vert—which are French green beans—oven roasted red potatoes, hard boiled eggs and Nicoise olives, drizzled with a shallot herb vinaigrette. Healthy Living Magazine: Where do we start? Kai Chase: First we’re going to sear off the ahi tuna. I’ve already crusted it with the herbs. We have some herbs de Provence that consists of dried lavender, rosemary, thyme, basil, oregano and Marjoram. We want to heat a saute pan on high heat. This way we’ll be able to create a nice crust on the ahi tuna. It should be raw on the inside and nicely coated and seared on the outside, to hold those beautiful herbs onto the ahi tuna. Healthy Living Magazine: Is there one particular herb or spice that you use in most of your meals? Kai Chase: I love garlic and cilantro. Having a Cuban background, I use a lot of garlic and a lot of cilantro. As we sear Ahi tuna, you can tell its reaching its desired doneness by the coloring. It starts getting a lighter color. I’d say cook the tuna for about 2 minutes per side for rare. You can leave it on a little longer depending on your liking. Now, we can start assembling the salad. I like to use a lot of different leafy greens such as red leaf lettuces, mesculin, watercress and endive. Organic and gorgeous. Healthy Living Magazine: Why do you have many different lettuces here? Kai Chase: That’s what makes the salad so pretty. Red leaf lettuce, green leaf lettuce, watercress, and escarole. You always want the salad to be pretty, and you get a lot of different spices with the different flavors of lettuces. Some are a little more sweet, some are a little more peppery. Healthy Living Magazine: How long does it usually take to make? Kai Chase: The long part is the prep. You want to boil all the eggs and sear off the tuna, but it should take no longer than 30 minutes altogether. Healthy Living Magazine: If one of your clients said to you “I have 15 minutes, make me a healthy meal,” what would you make? Kai Chase: What I’m really good at making in that time is breakfast. I enjoy making buckwheat blueberry, banana pancakes. Fast, simple, healthy and delicious! Healthy Living Magazine: So, you are very much into healthy eating? Kai Chase: Yes. I grew up eating this way. I’m a California girl—born and raised. Working for a lot of different celebrities is different from working for other clients. First of all it’s an honor to work for celebrity clients. But, being in the limelight, they are very particular and they have to look good. What I give to them is that element of health. So I’m almost done with assembling the salad. I roasted some red potatoes, so there’s a little bit of carbs. These are Nicoise olives, from the region of Nicoise. We’ll put a few of these around. Healthy Living Magazine: You make it look so simple. Kai Chase: Its an artistic thing. I like to make things look pretty. I used to work for Pamela Anderson at her restaurant called Sanctuary back in the early 90s. I was one of the line cooks there. You know Pamela— very pretty girl. Every plate was gorgeous, piled high and very decorative. People like to see that in restaurants. The presentation is everything! It makes it more palatable and more edible. Healthy Living Magazine: When did you decide you want to become a chef? Kai Chase: When I was very young. I would practice by making mud patties in the back yard. My mom used to say, “This poor little girl, she’s in smock and mud.” But I’d come with these patties with sticks and grass in them, and they’d look very pretty to me. So then I knew that I wanted to be a chef. But the culinary calling didn’t come that quickly. Early on I wrote for a music trade publication called The Urban Network for years. The politics of the business got to me and that’s when the culinary bug emerged. I was in my very early 20’s. Healthy Living Magazine: Did your mom cook for you when you were little? Was she a good chef? Kai Chase: Yes, my mom is from New Orleans, and my father is Cuban. They were both great cooks. My father makes great salsas and Cuban food. And my mother makes a lot of rich Creole and internationally exotic dishes. So I take both of those loves, and put them into my food and add to my creations. I do a New American style of cooking. Healthy Living Magazine: I think it looks amazing. What about the naan, do we serve that on the side? Kai Chase: Yes. We can grill it or toast it. It goes well with the ahi. You could take a little piece of naan bread, put in a little salad and a little ahi and eat it like that. It’s very tapa-esque. Or you could just have it on the side. This dressing is very complimentary for this particular salad. It consists of red wine vinegar, premium olive oil, oregano, basil and a splash of white truffle oil. Healthy Living Magazine: Can you share with us what Michael Jackson's favorite dish was that was made by you? Kai Chase: Michael's favorite dish that I made for him was this salad. The seared Ahi Tuna Salad Nicoise. Its very tasty. He liked the lean protein and the organic veggies around it. Healthy Living Magazine: He liked eating healthy as well then? Healthy Living Magazine: You know so much about healthy eating. Did you have to take a course, or is it something you studied on your own? Kai Chase: LA is the mecca of looking good. People look good here because they take care of themselves. They take care of themselves from the inside out. Growing up that way, I was really privy to a lot of fresh ingredients and healthy eating. I always shopped at the open farmers market growing up. As a kid I would go with my grandmother and shop for organic ingredients and help in the kitchen with my mom. In a small mixing bowl combine all ingredients for the vinaigrette, whisk to blend and refrigerate. Cook, Cut and prepare all of the vegetables (red potatoes, roma tomato, eggs and haricot verts). Place prepared lettuces in a separate bowl. Cover and refrigerate. Drizzle the EVO on the tuna loin and season with salt and pepper; Place the herbs de provence on a place and gently roll the loin over the herbs to coat. Heat a large, dry skillet over high heat. Add a Tbl. of EVO and gently lay the loin onto the sauté pan and sear for about 2-3 minutes (or desired doneness). Turn; cook until desired doneness. Slice the Ahi loin about ½ inch thick. In a large bowl, add the lettuces, and some of the vinaigrette and toss lightly. On a plate place the dressed greens and arrange the vegetables atop. Make sure to arrange the vegetables around the salad to make a pretty compound salad. 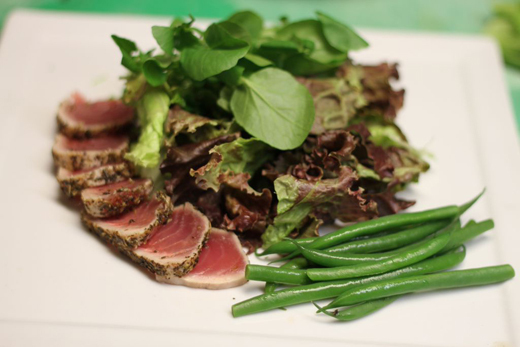 Arrange the Ahi on top of the greenery. Drizzle with more of the vinaigrette and fresh cracked pepper. Serve and enjoy. Next.